If you must read Sigrid Undset - and I recommend you do - you'd better be prepared. Be prepared for an emotional ride. 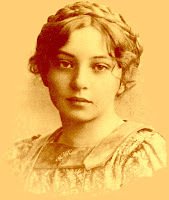 Sigrid Undset is a woman, by the way, and a major Norwegian author of the early twentieth century. A major author of everywhere, actually. And she ought to be still. You'll probably begin with Kristin Lavransdatter because everyone will make you feel like you ought to have read it already. But let me warn you, you're going to wonder if it was really a good idea. One friend who was nearing the end of the first volume (of three, written in 1920 - 1922), said that, though it was very good, it was so hard to endure all that the protagonist was putting her through that she wondered if she should continue with the next two. My advice was that she must - even knowing that ten years hence she will probably pull it out of the chest she has locked it in just to throw it against the wall once more. There's very little you can do about this, but read it you must. Not only because it is a very good book. Not only because the author was awarded the Nobel Prize for Literature in 1928 largely for this work. Not only because it will get deeply into you and you will never really get over it. You must read it because, let's face it, it's one of those books, written by one of those authors that will make you look really smart when you throw their names around. Because Sigrid Undset was Norwegian, you will be reading a translation (there are two: the "just-tell-me-the-story" version and the "I-want-to-feel-like-I'm-reading-a-real-medieval-saga" version). Other people who share the goal of looking well-read will be using this author to try to impress you, so you'll be wise to read several of her works. The good news is, if you've read Kristin Lavransdatter, the rest will be easy. Well, they won't wreck you as much as this one will upon your first reading of it. (I'm not sure anyone ever really does read it again, it being so traumatic). It is set in the fourteenth century, so you can look forward to learning a lot about the brief Catholic period in Norway and amazing details of life during that time. Think of a world where, the colors of all the clothes came from nature and the plants from which they were derived only grew at certain times of the short growing season, so it was important to collect them when they appeared! Also, babies were dressed in swaddling clothes - like Jesus, - diapers not having been invented yet. When you recover from that book, I might suggest some of her other books. I myself have not yet read all of her novels. There's only so much time to read and then recover before reading again. 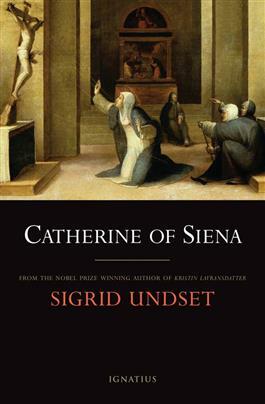 Although Undset has set several of her novels in medieval Norway, it is not the medieval period that she specializes in. Many, including Images in a Mirror (1938) and Ida Elizabeth (1932) take place in the early twentieth century. Her brilliance in the medieval period, however, is owed largely to the early influence of her adored father, who was a widely regarded archaeologist. Before his early death when she was eleven, she had absorbed his interest in and love for Scandinavia's back story, which she continued to delve into herself. This love for her country is woven through her works, but her focus is women. Women and love - complicated, often immoral, love. Undset plumbs the depths of the human person, allowing her reader to dip into the well of pain inherent in the challenges of romantic love, fidelity, responsibility, family and, ultimately, growth. Her protagonists suffer into becoming more fully human. And it is usually not a comfortable journey. Sigrid Undset had a penetrating understanding of human nature. She also surely drew from her own experiences of longing for love, finding it in a difficult and problematic marriage, an intense maternal devotion to her own children. She set up her own family home with a deep sense of beauty and cultural tradition. She was not merely a Norwegian citizen; Norway ran through her veins. It runs likewise through her stories, which all take place in the various times throughout the landscape with which she was intimate. If you are unfamiliar with this beautiful landscape, I urge you to stop now and do a quick Internet search of "Norway scenery images." Breathtakingly beautiful, yes? Sigrid Undset's novels reflect this landscape in their depth and height and passion. And they will take your breath away! Since I have no wish to leave you lying there with the wind knocked out of you, I will offer you a few suggestions for surviving this marvelous author's works. Read about the author. The first biography I found (The Art of Compassion by Yola Sigerson) was enlightening, but because it was written by a confirmed atheist who clearly disapproved of Undset's conversion to Catholicism, missed much of the depth of the author as she matured. There are others, however, and I plan to read at least one other. Do read at least a sketch of her life. It clearly contributes to the brilliance of her fiction. It will also give you time to recover from one novel before irreparably plunging yourself into another bout of growing pains. Here's a tip I learned from the happy accident of my own experience. While reading Ida Elizabeth, I happened to also be reading Death Comes For the Archbishop, by Willa Cather (which I must tell you about another time). It is also an excellent book, but serene and peaceful. It gave me a place to retreat to, to smooth out the anguish caused by Undset's book. I may not have survived outside of this method. Find a soothing book to read whilst reading one of her novels. You could even choose her own biography of St. Catherine of Siena (1951)! Another survival method I recommend is to read Undset's non-fiction between the novels. There is much to choose from. Because she was Norway's most famous author and was outspoken against Hitler, she was advised to escape her country in the earliest days of the Nazi occupation of Norway. Before the war was ended, she wrote of this journey - through Russia by train, Japan to San Francisco by ship and finally on to New York, where her publishers, Alfred and Blanche Knopf, helped her to settle in and make her living speaking throughout the country. She lived in the U.S. for five uncertain years, looking with hope to a time when Norway would be free and would rebuild from the ruin and devastation wrought by the German occupation. She continued to denounce Nazism and urge the support of the allies by her host country. Her account of this time is found in her book Return To the Future (1942). During her exile, First Lady Eleanor Roosevelt suggested to Sigrid Undset that she write of happier times in Norway to give hope to her countrymen and help them keep in their hearts the Norway they were seeing utterly destroyed. The lovely little book that answered this request is called simply (and unsurprisingly), Happy Times in Norway (1942). Undset also engaged in the debates of the day through essays, some of which are collected into books such as Men, Women and Places (1939). The most rewarding tasks are usually difficult and require perseverance. I promise your perseverance through the works of Sigrid Undset will be rewarded - first by impressing your well-read friends. Next, and more importantly, by the enjoyment of reading a book you won't want to put down (or at the very least, you will pick up again every time you hurl it against the wall). And finally, by imbibing her marvelous ability to vivify not only characters, but places. Her novels manifest the terroir of Norway! So true! I am proud to say that I introduced you to Sigrid Undset (I think) and that I kept you from hurling my copy (from the library) against the wall. I'm going to argue that you ONLY read the Tina Nunnally translation. Its more clear on many details (including the homosexuality of a minor character that moves the plot forward). I'm all for both and! Just out of curiosity, which character. I missed that! The Master of Hestviken quadrilogoy is more punishing that KL, IMHO. Non-Catholic reviewers really struggle with it. Follows a man's life. A near incredible shake down. I found this set at the thrift store and bought it, but have yet to dive in. I'm a bit intimidated! I love your recommendation! Ha ha! Some day I'll read it - when my life gets boring and I don't have a canker sore to poke my tongue into to make sure it still hurts. I switched to her non-fiction (Her account of her escape and exile from Norway during WWII is eye opening) and biographies of her (Mitzi Brundsdale's Sigrid Undset: Chronicler of Norway is really insightful, but you have to mentally screen out some of the academic bias). Thanks for your comment! Mariellen read most of her Kristen books to me . And then we took on her Hestviken ( sp.???) trilogy together. We put aside her Ida Elizabeth several years ago and haven't returned, alas. I promise to read all of your novels when they appear, about folks' adventures in So Cal. Ha ha! Thanks Peter! I don't think I have any novles in me! I first read Kristin in my 30s and loved it! Then I retuned to it again in my late 40s and couldn’t believe that I loved it. I think there is a window in a person’s life for this trilogy. I have also shared Sigurd Undset with many friends and now that I know of more of her books, I will continue to read her. Thank you for your thoughtful words.